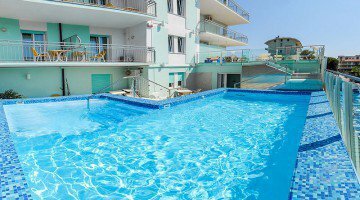 The Bahamas Hotel , 3 star hotel in Lido di Savio, family owned for over 40 years. Ideal for family holidays, it has a swimming pool, wellness center, parking, WI-FI and services for children. It accepts small and medium-sized animals for free. The hotel is located in Lido di Savio about 3 minutes walk from the beach, in a green area near the pine grove. The location is convenient for those who want to visit Mirabilandia and the Zoo Safari, reachable by car in about ten minutes. The rooms have a balcony, WI-FI, telephone, satellite TV and digital TV, safe, bathroom with shower and hairdryer. It includes the addition of accessories for children and, upon request and payment, a minibar and air conditioning. STANDARD : from 13.5 to 20 square meters, it can be double, triple or quadruple. ESPLOROOM : room dedicated to families with children, decorated in a marine and underwater theme with a fairy tale setting, is available with 3 or 4 beds, a lamp that produces the sounds and colors of the sea, games and accessories for the little ones. FAMILIES: Standard connecting rooms with shared bathroom. Swimming pool with hydromassage at set times, equipped terrace / garden, bicycles also with child seat, wellness center with sauna, Turkish bath, solar shower and massages (with charge), bar room with satellite TV, lift. The hotel is equipped for cyclists and the staff periodically organizes theme parties with entertainment. PARKING : uncovered and available free of charge subject to availability. AIR CONDITIONING : available in the room on request and with supplement. AGREEMENTS : beach, amusement parks, paid shuttle service. SERVICES FOR DISABLED PEOPLE: entrance located on the ground floor with inclined ramp, standard lift, room with wheelchair space, shower with wheelchair access. PETS : pets of small and medium size are admitted free. BREAKFAST : sweet and savory buffet to be enjoyed on the outdoor open-air porch with cold meats, cheeses, jams, fruit juices, biscuits, ring-shaped cake and homemade cakes. LUNCH AND DINNER : typical local cuisine, prepared by the owner with genuine ingredients "farm-to-table". Three menus with meat and fish, 2 hot side dishes, buffet of appetizers and vegetables, fruit and dessert. Microfiltered water with meals is included. CHANGES : the menu is suitable for vegetarians and with prior notice they prepare meals for celiacs and for those suffering from food intolerances. In the hotel : indoor playground area, children's library (also in language), bicycles also with seats, strollers and entertainment. In the room : “Esploroom” with a themed setting on the sea, cribs, beds, bath tub, toilet reducer, sides, courtesy light. At meals : seats at the table, placemats and colored cutlery, flexible hours, baby menu, preparation of baby food at the time, bottle warmer, cotton candy. 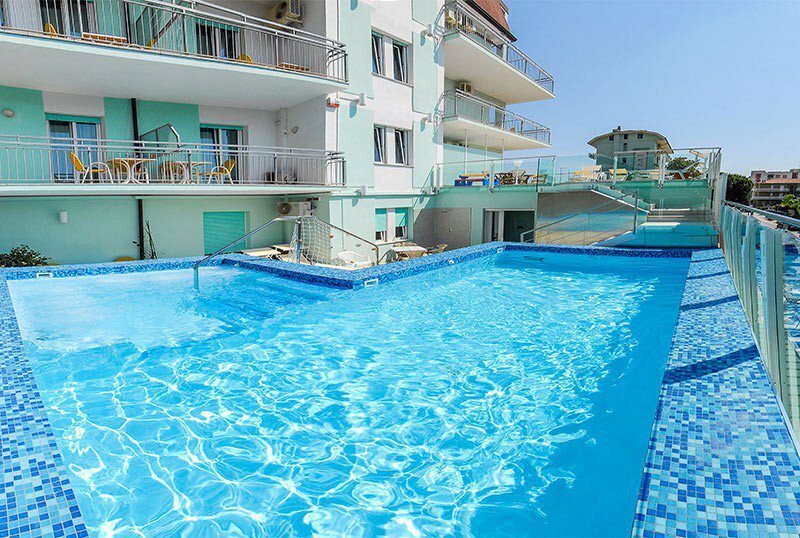 It has a 25sqm swimming pool with a height of 94 to 126 cm, located on the first floor. 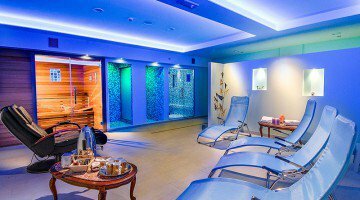 Heated, with hydromassage and counter-current swimming, surrounded by a solarium area equipped with sunbeds, tables and chairs. The hotel's wellness center consists of an internal area with wellness treatments, Finnish sauna, emotional showers, Turkish bath, relaxation area and massage area and an outdoor area with hydro-massage pool, counter-current swimming and vascular treatment. The hotel has an agreement with the Riviera n.18 beach and Bagno La Scogliera, establishments equipped for sports and children. - Promotions can not be combined. - The agency commissions and the Tessere discounts (Touring, Amica) are applied to the full price and can not be calculated on the promotional weeks. - Following the booking an advance deposit will be requested by bank transfer. Spend 3 days of your choice between April 29th and May 30th and you will have 2 hours for healthy relaxation to spend in our spa! Discounts for children and discounted tickets for the most beautiful parks of the Riviera: Mirabilandia, Safari, Itlalia in Miniatura and Oltremare! Come to the Bahamas Hotel to spend your Easter and the Spring Bridges! Our offer is valid for stays of minimum 3 days from April 18th to May 1st, in Formula B & B starting from € 35.00 per person per day. Possibility to choose half board and full board with Easter Dinner and chocolate egg in homage to children. For those staying for a minimum of 3 nights, a free entry to our SPA is included. Packages with discounted tickets for amusement parks and for Mirabilandia (FREE child). Many discounts for children based on age. Anyone booking a minimum of one week will have an additional discount depending on the day. Take advantage of our family offer. Two adults and two children under 14 pay three dues, 4 = 3. The offer is valid both in half board and in complete including water with meals, beach, entertainment, swimming pool, WI-Fi. Also this year we collaborate with Mirabilandia and we can make super packets. We can offer you personalized offers including ticket (valid for 3 days) with more or less days, even half or full board including water with meals and beach. SPA and massages on request. Until 30 June 2019 free child with a paying adult, Area Ducati not included in the ticket. Do you want a further discount on the price? you will receive a 5% discount on the price of a minimum stay of one week. Possibility to also make half board always including water with meals, beach with private umbrella, WI-FI, entertainment, swimming pool and bike.